Randall Waguespack and John Acosta grinned and ribbed each other as they talked about sweating and bonding with 300 fellow volunteers on a blistering hot day Sept. 23 at St. Margaret Queen of Scotland Church in Albany. They helped strip the church of its contents and created a temporary place of worship in the parish hall to prepare for the building’s renovation and expansion. “We did it in about two hours,” Waguespack proudly announced. Waguespack and Acosta struck up their friendship through Evergreen Life Services in Ponchatoula, which has a mission of serving, providing for and championing people with disabilities. Evergreen recently received a $3,000 grant from the Bishop Stanley J. Ott Works of Mercy Trust Fund of the Diocese of Baton Rouge. Waguespack, executive director of Evergeen, St. Margaret parishioner and candidate in the permanent diaconate program, noted the Works of Mercy grant will help Evergreen, which started in north Louisiana as a Presbyterian mission, to better serve its people, especially when it comes to providing religious educational opportunities for people of all faiths. “We want to help them get in touch with their religion and faith, to help them have a more fulfilled faith life. I think the everyday stress and anxiety comes as well to the people we support. I think you can get a lot of grace and a lot of enrichment just by participating in your faith,” said Waguespack. Evergreen focuses on developing one-on-one and family relationships with the people they serve. In Waguespack’s case, he invited Acosta to attend Mass with him and his family at St. Margaret. Acosta said he had stopped attending Mass about five years ago when his father died. Waguespack’s invitation prompted Acosta to think about becoming involved in church again. He plans to register at St. Margaret and become involved in parish ministries. “He’s met a lot of people there. A bunch of people already know him by name. More people seem to know him than me,” Waguespack said, exchanging grins with his friend. Evergreen is helping Acosta transition from a group home to independent living. Acosta lives in a group home in Independence, but Evergreen helped him land a job at a department store in Mandeville and provides him with transportation and job coaching. He is hoping to move into an apartment in the next few months. Acosta is one of two siblings living in a group home, according to his mother, Sharon. His brother, Joey, has been in a group home for the past 25 years. Sharon said with the death of her husband, she made the difficult decision to move them into a group home so they could get the care they need and is thankful for Evergreen’s support of her sons. “He (John) was so depressed after my husband died that he wouldn’t go anywhere. Now he’s got a job and is a social butterfly and wanting to go back to church,” said Sharon Acosta. It’s also through the help of Evergreen that Elizabeth Larose of New Orleans connects weekly with her sister, Adele Larose, who has lived in a group home in Baton Rouge for the past 25 years. Evergreen brings Adele, who uses a wheelchair, to St. Jean Vianney Church in Baton Rouge to attend Mass with Elizabeth. After Mass, the two treat themselves to coffee and donuts. Evergreen also brings Adele to a family gathering once a month in Thibodaux. St. Patrick Church is among the Baton Rouge churches looking into the possibilities of working with Evergreen to provide hands-on ministry for people with special needs. “People have different kinds of abilities and we want to help them,” said pastor Father Michael Miceli, reflecting on the church’s embracing all people and looking at what they can, rather than can’t do. Father Miceli noted at St. Patrick there are people with disabilities who capably serve at the altar and sing beautifully in the choir among other things. Beryl Hebert will be working with Evergreen to recruit volunteers from St. Patrick to help people with special needs. 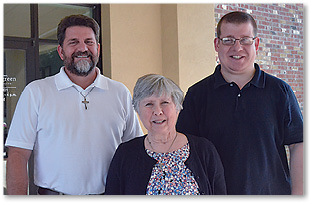 She is transitioning from campus ministry at Christ the King Church and Catholic Center in Baton Rouge to working with people with exceptionalities in the RCIA and Catechesis program at St. Patrick. “Community has always been a part of my faith life, both small and large community,” said Hebert. She spent nearly 40 years working with children with special needs and their families as a program specialist for children with significant disabilities in the East Baton Rouge Parish School System. “I loved it. They ministered to me,” said Hebert, her face aglow. She acknowledges there is a cross to bear for families with members with disabilities, but she believes people with special needs bring many gifts. Hebert’s role model is St. Teresa of Calcutta. “Mother Teresa and her sisters reached out to the poor and educated them and taught them about the love and mercy of Jesus,” Hebert said. When it comes to people with disabilities, Hebert said there is a lot they have to teach the general public about Jesus. For more information about volunteer opportunities and services visit evergreenls.org.